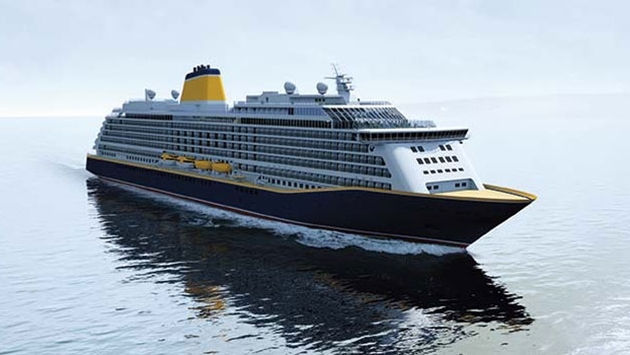 Saga Cruises is a relatively unknown brand in the United States as it’s part of the United Kingdom-based Saga Group, operating a pair of hand-me-down ships currently, but it recently caught our attention for what will soon be its first new-build. In fact, it gives the international industry some ideas of how a smaller ship can offer a grand experience as a sort of hybrid sweet spot in between intimate and mega vessels. The ship will likely shake up the marketplace when it launches in summer 2019 accordingly. The as-yet-unnamed vessel will only measure in at 55,900 tons—only slightly bigger than Viking Ocean Cruises’ new Viking Star and sister-ships—with a capacity of just under 1,000 passengers. 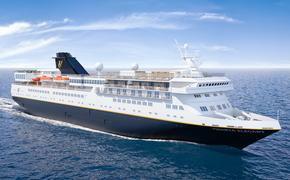 However, as evidenced by recently revealed renderings, viewable at Saga Cruises' website, the ship is set to make a dramatic impression. The spaces look more reminiscent of a much larger classic ocean liner like Cunard Line’s Queen Mary 2 than any small cruise ship that has come before. The inside of the ship represents grand elegance with a soaring atrium that strikes a perfect balance between traditional and modern decors and a double-decker dining hall that is all class. For now, the majority of the renderings showcase the ship’s exterior and, again, convey a ship that appears much larger than it actually will be. The dark hull line that dips down past the bow reminds me of Disney Cruise Line’s Disney Dream and Disney Fantasy, but the superstructure is more contemporary looking for a unique juxtaposition. The only concern I have from looking at its exterior is what appears to possibly be an offset observation lounge at the forward top of the ship. While such a feature is always welcome, it seems to be set back quite a bit behind a lower sun deck, which may very well cause forward-facing views to be obstructed. In either case, the architecture is bold while still being sleek in all the right areas. As for specific features, another distinctive specification is not only that all 540 cabins will feature balconies but also that about 20 percent of them will be dedicated to solo travelers. This is a brilliant consideration because any ship that has a selection of studio staterooms currently has them sell out extremely quickly, indicating a high demand. This will be a much higher percentage of the accommodation type to go around that may encourage the rest of the industry to up their solo cabin numbers as well. Still, the main takeaway thus far is how the ship seems to be striving for a mix of intimacy and grandeur. For years ships have gotten larger with each new iteration, and only recently is there a trend in the other direction to go smaller as well. This ship will presumably marry the two approaches by offering lots of choice with specialty restaurants, bars, indoor and outdoor pools, a spa, library, observation lounge and more to a smaller group of guests. Of course, a smaller ship can only contain so much, but the chance of offering a decent amount of choice activities, dining and entertainment options to a passenger complement less compacted into a crowded mega ship is a desirable proposition for sure. It’s a concept that might spawn a new generation of cruise ships, but the price would also have to be higher to compensate for fewer guests than on a ship geared towards an economy of scale. Nonetheless, there may be a new trend here, niche as it may be.